I am a lady in my late 40’s and realise that the risk of having health problems as I get older, is increased because of being overweight. I had tried meal replacement shakes some years ago, but apart from the unpleasant taste, found that I started having dizzy spells, so the little bit of weight I did lose came back immediately when I stopped. 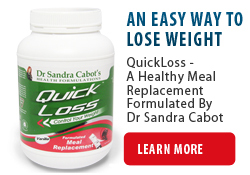 Having a family, and working, means that I am time-poor so I decided to give Sandra Cabot’s QuickLoss Meal Replacement Program a try. I am delighted to say that I have had steady weight loss, and have now lost 11 kilograms, and just by replacing my lunch with QuickLoss and following the guidelines for my snacks and evening (family) meals. Not only am I able to fit into my old jeans, that haven’t been worn for a long time, but I am also receiving compliments from friends and work colleagues. I certainly don’t feel like I’m on a “diet,” and having my shake feels a little like an indulgence because I enjoy the flavour so much. The snack ideas, for morning tea, easily see me through until my shake at lunchtime, and the QuickLoss shake keeps me well satisfied until my evening meal. I feel great, and it’s been so easy! I Feel Great, It’s Been So Easy.